4 Stars of the best Auntie (BBC) can offer. For many years I could not stand David Starkey, being outspoken, overbearing and speaking down his nose at you; always making me feel like a naughty schoolboy being lectured by his betters. 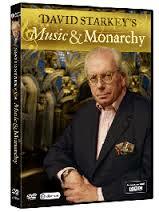 But this is the BBC at its best, Starkey takes us through 700 years of the influence that the monarchy have had upon the way that music has shaped this country and the rest of Europe.